This article provides information about Japanese non-alcoholic beers, for people who want to sample the taste of Japanese beer without the actual alcohol. Japanese alcoholic beverages are quite well-regarded for their taste, even by international visitors. Past articles at MATCHA have covered beverages like the drinkable and low-ABV Horoyoi, as well as various staple Japanese beer products. However, there are also people traveling in Japan who don’t like the taste of alcohol or abstain for religious reasons, but who may want to casually sample how these drinks taste without the alcohol. There are non-alcoholic beers available in Japan for these people. Recently, some Muslim tourists have also looked forward to these drinks as part of their trip to Japan. For this article, we’ll take a look at non-alcoholic beverages that taste like beer. 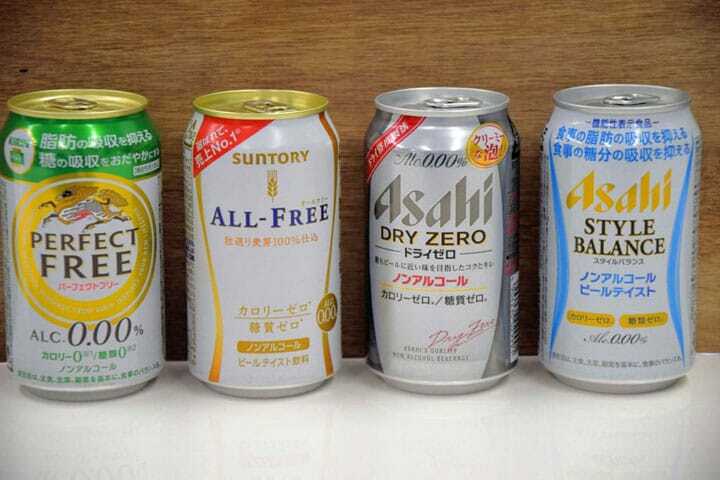 You can find non-alcoholic beers at convenience stores and supermarkets in Japan. The range of available products has steadily increased, and the cost of a 350ml can is generally 100 to 200 yen, a very reasonable price compared to regular beer. Furthermore, because the non-alcoholic beers listed here contain zero calories and zero sugar, they are suitable for people who are watching their figure. The first beer we will introduce is the Kirin Perfect Free. This slightly bitter beverage tastes very close to the real thing. It also has a somewhat sweet aftertaste and a faint, hoppy aroma. A can of Kirin Perfect Free is easy to drink and has an enjoyable flavor. In addition, Kirin Perfect Free’s most significant trait is the fact that it contains water-soluble dietary fibers. For that reason, after drinking a can, you can expect it to have a limiting effect on the amount of fat and sugar you absorb after a meal. It also improves mineral absorption, and pairs perfectly with food. Suntory All Free is a mild, drinkable beverage with a refreshing aftertaste. As it has almost no bitterness, we recommend it to people who don’t like bitter-tasting drinks and people who are trying non-alcoholic beer for the first time. Asahi Dry Zero has a powerfully bitter taste that rivals that of real beer. It has less carbonation than other similar products, but you could say that makes it easier to drink. As the name would indicate, the secret to its success is its “dry” taste. Asahi Style Balance is another Asahi product. Compared to Dry Zero and real beer, it is less bitter, with a clear, refreshing taste and a sweet aroma. Like Kirin Perfect Free, it contains water-soluble dietary fibers, and pairs well with food. It tends to be cheaper than other products, so it’s a good drink for bargain seekers. Japanese non-alcoholic beer cans are all designed to look like the real thing. “I wanted a non-alcoholic beer, but bought a real one…” “I wanted a real beer, but I bought a non-alcoholic one…” If you can’t read any Japanese, you may find yourself saying these words. Here’s a way to tell the difference without being able to read the words. Alcoholic beverages will have Braille dots on the lid of the can, but non-alcoholic drinks, like juice, will not. If you know this, you have nothing to fear. Double-check when want to purchase your drinks, be they alcoholic or non, just in case. Exclusive To Asakusa's Don Quijote: Halal Japanese Souvenirs! [Izakaya] "Nomihōdai": All You Can Drink For A Fixed Price! ?